North Korea: Who Sank the Cheonan? This article by investigative reporter Tanaka Sakai points to the possibility of friendly fire between two vessels. Since this report was published, US Submarine Columbia has returned to Hawaii. On 26 March, 2010 near Baengnyeong Island (White Wing, also known as Baekreong) to the South of the northern limit line, the maritime demarcation line between South and North Korea, South Korea’s large patrol boat Cheonan (Heaven’s Peace) exploded and sank. Already, more than one month after the accident, the cause of the sinking has not been confirmed. 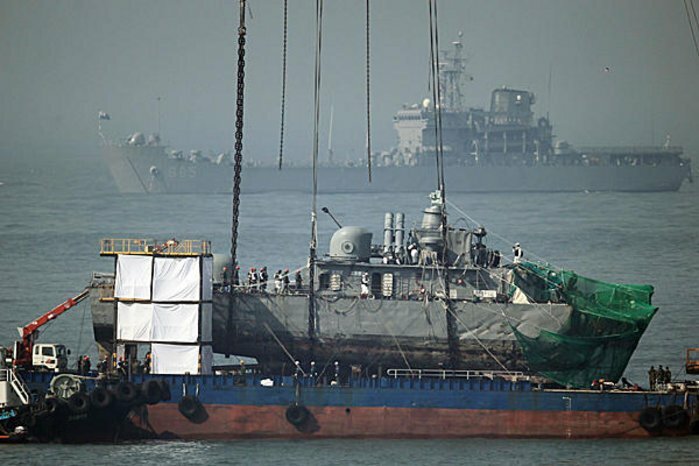 In early April, the South Korean government announced that either a torpedo struck or an underwater mine exploded, sinking the ship, indicating that it was not destroyed by an explosion or accident inside the boat but by an external cause. The stern of the Cheonan docked on a barge off Baengnyeong Island on 7 May, 2010. Lee Jung-hoon. However, it remains an enigma as to who fired or set off a torpedo or underwater mine. The South Korean right, claiming that a North Korean semi-submersible ship fired a torpedo, demands that the South Korean government launch a revenge attack on the North. The left and pacifists in the South suggest that the warship may have touched off an underwater mine installed in the 1970s by the South Korean military to prevent North Korean infiltration and still left there. Baengnyeong Island is only 20 kilometers from North Korea in an area that the North claims as its maritime territory, except for the South Korean territorial sea around the island. At present there are two demarcation lines on the sea. South Korea and the US (UN) claim that the Northern Limit Line (NLL), which runs just north of Baengnyeong Island, is the demarcation line between North and South. However, since 1999, North Korea has claimed that the Military Demarcation Line further south is the border between North and South. 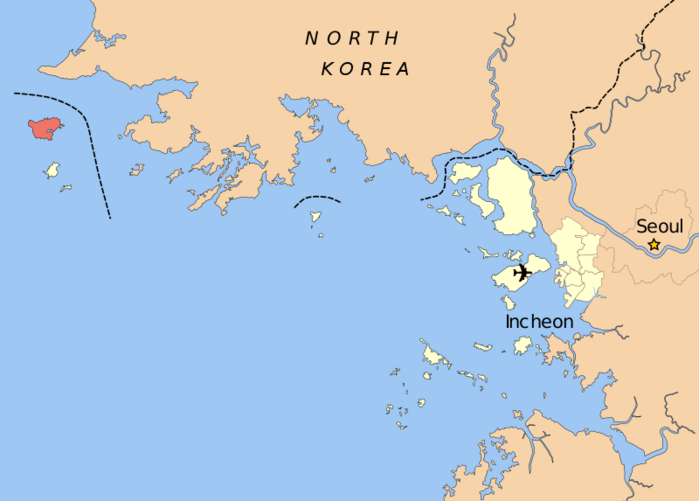 About 5,000 South Koreans live on Baengnyeong Island and regular ferries link it from Inchon. In the reconciliation between North and South in the year 2000, North Korea recognized this ferry route and the sea around the island as an area where South Korean and American boats can navigate freely. At the same time, North Korea has regarded American and South Korean boats entering the sea area beyond that as violating the economic zone of North Korea. In the vicinity of Baengnyeong Island South Korea constantly confronts the North Korean military. The Cheonan was a patrol boat whose mission was to survey with radar and sonar the enemy’s submarines, torpedoes, and aircraft, and to attack. If North Korean submarines and torpedoes were approaching, the Cheonan should have been able to sense it quickly and take measures to counterattack or evade. Moreover, on the day the Cheonan sank, US and ROK military exercises were under way, so it could be anticipated that North Korean submarines would move south to conduct surveillance. It is hard to imagine that the Cheonan sonar forces were not on alert. South Korean military spokespersons told the media immediately after the incident that the probability of sensing torpedoes two kilometers away with sonar was over 70 percent. Later the probability was reduced to over 50 percent because the water is only 30 meters deep. This reduction, I believe, is for the purpose of theorizing North Korean responsibility for the attack. The sinking of the Cheonan remains unsolved. But around the time of this incident another sinking occurred that has hardly been reported in Japan. Near the site of the sinking of the Cheonan, a colossal object, which appears to be a US submarine, was found to have sunk. An ROK underwater team searched for, and on April 7 South Korea’s KBS TV showed, a US helicopter carrying what seems to be the body of a US soldier. KBS is a public broadcasting station with the highest credibility in South Korea. Following the sinking of the Cheonan, in the course of conducting an underwater search, a member of the special unit of the ROK Navy, UDT-SEAL (Underwater Demolition Team, Sea Air Land) Han Joo-ho, lost consciousness and later died. This was a secondary disaster. While collecting information on the death of Warrant Officer Han, KBS learned that his memorial took place neither near where the rear of the ship was found (the first buoy), nor near where the head of the ship was found (second buoy). Rather, it was six kilometers away near the third buoy, between the first and second buoy, that is, at a location that had nothing to do with the Cheonan sinking. A map provided by KBS TV. The third buoy to the East of Baengnyeong Island is where the head of the Cheonan sank, and the rear of the Cheonan sank to the West. The map of the search generally reported: two black dots to the South of Baengnyong are where the halves of Cheonan reportedly sank. The third buoy is not shown. US and ROK troops at work searching the sea several hundred meters from the cliff of the island. 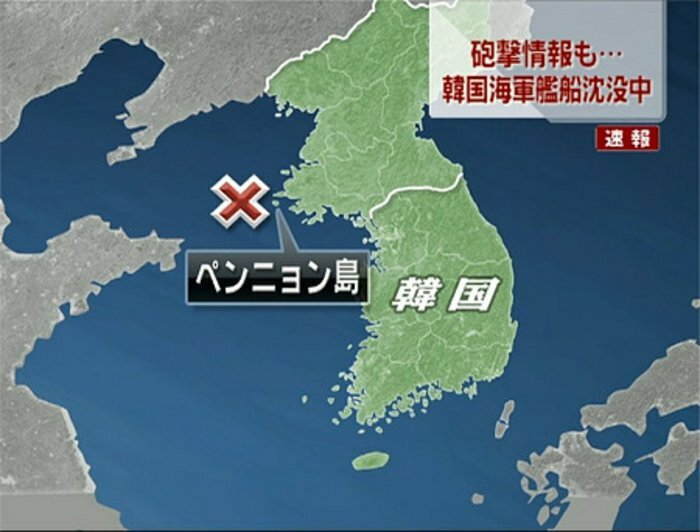 The first and second buoys where the Cheonan sank are both separated from the island by about two kilometers, and are not right in front of the cliff as shown in this Yonhap News photo. This is likely to be the place of the third buoy where the US submarine sank. But there South Korean reports claim that this is the location of the search for the Cheonan survivors. This site is the source of the maps and photo. Warrant Officer Han, who dove at the third buoy, lost consciousness and later died. KBS, while investigating UDT-SEAL and other sources on the sea bed at the location of the third buoy, learned that something like a large submarine had sunk and that the interior of the submarine was quickly searched under US military jurisdiction. ROK and US authorities did their best to hide the fact that a US submarine sank at about the same time as the Cheonan. The ROK authorities did not announce the sinking of the US submarine, nor did they call Warrant Officer Han’s death an accident which occurred while searching inside a US submarine. Instead, they announced that he died while searching for Cheonan survivors’ bodies. Warrant Officer Han was honored as a national hero. However, the memorial for Warrant Officer Han was performed not at the site of the Cheonan, but at the site of the sunk US submarine. US Ambassador Kathleen Stevens and Commander-in-Chief Walter Sharp of US forces in Korea attended. They praised Han and offered solatium to the bereaved family. The attendance by high US officials and monetary payments probably were for the purpose of suppressing anti-American sentiment that might blame the delayed search for Cheonan survivors caused by the precipitous US search for its own victims, resulting in Han falling victim. An object like a corpse pulled up from the sea at the third buoy was taken away not by an ROK helicopter but by a US military helicopter. This too suggests that what sank at the third buoy was not an ROK ship but a US military boat. The search and recovery of the Cheonan was given to a civilian company and the command of the operation was in the hands of a Korean barge. The search at the third buoy was conducted by a special ROK UDT-SEAL team and the latest ROK light-weight aircraft carrier, the Dokdo, served as the command center. What can be assumed from this disparity is that the US and ROK military prioritized the search for the American submarine at the third buoy over the search and recovery of the Cheonan. This is especially the case for the US military, which commands the ROK military. After the incident, the start of the search and recovery of the Cheonan was delayed, probably because US and ROK authorities prioritized the search for the US submarine. KBS TV in the 9 o’clock news featured this under the title, “The Mysterious Third Buoy. Why?” Subsequently, a number of ROK newspapers and magazines reported on the incident. The ROK authorities vigorously criticized these reports and sued KBS for “false reporting” and maligning the government. After the trial, the KBS website had to stop displaying film and articles about the incident. The Mysterious Third Buoy. Why? A gag order was issued to the UDT-SEAL team. When it was found that the problem of the third buoy was not about the ROK authorities but about the US military, official pressure increased and KBS and other Korean media stopped reporting on the incident. As in Japan, the Korean media, which is subject to American authority, seems to share an implicit rule not to inquire into US military matters. A Nuclear Submarine Armed with Nuclear Weapons was Underwater? KBS, which reported on the existence of the third buoy, was criticized for filing a false report. Thereafter, the possibility that the Cheonan was attacked by an American submarine was regarded as a dangerous and groundless rumor, and was virtually suppressed in South Korea. However, the suspicion that the Cheonan sank as a result of friendly fire surfaced within the South Korean media immediately after the event. On the day of the incident, ROK and US forces were conducting the joint military exercise Foal Eagle to the south of Byaengnyeong Island. According to a joint US-ROK announcement, the exercise was to have been completed on 18 March, but the actual exercise was prolonged to 30 April. On the day of the incident, the exercise was underway. After the incident, the US-ROK authorities made no mention of the fact that the joint military exercise was in progress. But the day after the incident, various ROK media and newspapers reported that the Cheonan might have been sunk by friendly fire during the military exercise. In response to the report, ROK authorities acknowledged that the military exercise was in progress, but stated that it was not taking place near Byaengnyeong. Rather, it was off the coast of Taeon, Chungchong Namdo, which is about 100 kilometers to the south of Byaengnyeong. ROK authorities announced that the Cheonan did not participate in the military exercise. But a high-speed ship can reach Byaengnyeong from Taeon in two to three hours. Since last year, the DPRK has been criticizing the US and ROK for threatening activity in approaching its maritime area during ROK-US joint military exercises. This time, too, US and ROK ships may have gone north close to Byaengnyeong island. If the Cheonan had sunk during the exercise, the ROK authorities, in order to avoid criticism from North Korea, would not make such an announcement. Although the authorities announced that the Cheonan did not participate in the exercise, it is possible that the announcement deviates from the fact. The Jaju Minbo of the ROK (left wing) analysed the KBS News report. What is interesting is the analysis of the geographical environment of the third buoy where the submarine sank. The American submarine sank in the offing several hundred meters off the coast near cliffs that are called Yongteurim Rocks, on the southern side of Byaengnyeong. Around Byaengnyeong Island there are many shoals where submarines can run aground while underwater, but the sea in front of the cliffs is deep. There, the northern and eastern sides are divided by land and if North Koreans tried to watch Byaengnyeong from their territory, they would not be able to locate a US submarine on the south side of the island. 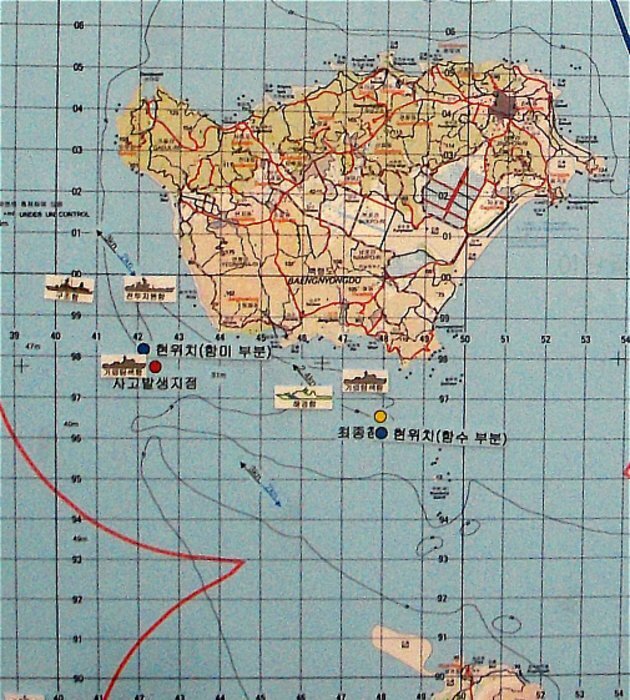 North Korea recognizes the sea area around Byaengnyeong as ROK territory. A boat moving underwater near the island would not be attacked by the North Korean military, making this a safe hiding place for a US submarine. Byaengnyeong Island is the nearest point in South Korea to Pyongyang . . . about 170 kilometers. For the US-ROK military, it is the best place to counterattack in the event of emergency, and it is also well placed for radio interception. If the US places a submarine near Byaengnyeong Island and it stays for a long time, in the event of a North Korean attack on Seoul, the submarine can fire a missile within minutes. A submarine employed for such an operation is undoubtedly an atomic submarine, which can stay under water for one month. An atomic submarine extracts oxygen using electric power generated by the atomic reactor on the boat by electrolysis of sea water. Unlike a diesel submarine, such a boat does not have to surface at all. Many US atomic submarines can be loaded with nuclear missiles. In order to counter North Korea, which claims to be armed with nuclear weapons, the US military might maintain a nuclear-armed submarine at all times near Byaengnyeong Island, the closest point to North Korea. If the US and ROK military installed a missile aimed at North Korea on Byaengnyeong Island, they would be fiercely criticized by North Korea, which would agitate ROK citizens who regard citizens of the North as their brethren, necessitating removal of such a missile. However, a US submarine loaded with atomic missiles underwater near the island would have the same effect as a land-based missile at a time of emergency. It would not be known by the North, nor would there be a need to inform ROK citizens about it. Thought about in this way, the possibility of a US submarine armed with nuclear weapons being near Byaengnyeong Island is almost greater than its not being there. Many US atomic submarines have more than 100 crew members. They operate the submarine by night and day shifts, so the crew is large. If a US submarine sank under the third buoy, there could have been many victims, their number comparable to those who died in the Cheonan incident. There is also the fear of radioactivity leakage. What the US military hastened to recover from the sunken submarine could have been a nuclear warhead. That is why the UDT-SEAL team of the ROK military was made to conduct the search hastily. Warrant Officer Han’s death on duty occurred in the process. The sinking of the Cheonan was widely reported immediately, but the sinking of the American submarine was concealed by the US government, and the ROK authorities were made to assist in the concealment. The reason for concealing the sunken submarine is probably to prevent North Korea and ROK citizens from knowing that a US submarine was underwater near Byaengnyeong Island for the purpose of attacking North Korea in time of crisis. If that fact became known, the North would be angry and attempt some form of retaliation, and anti-US sentiment among ROK citizens would be fanned. But, because KBS and others reported on the sinking of the US submarine, even though handled as an error, the North can be presumed to have grasped the steps of this event fairly well. Mistaking the American Submarine for a North Korean Submarine? The discussion so far has not come to the most important question: why did the Cheonan and the American submarine sink? I will address this now. The Jaju Minbo article, which analyzed the report by KBS TV, writes that a North Korean submarine came South, attacked the Cheonan and the US submarine, and may have sunk both boats. However, in my view, the possibility of the North having done this is extremely low. Right after the Cheonan sinking, the US and ROK governments announced that there was little possibility that the Cheonan sank as a result of North Korean attack. If there had been a North Korean submarine attack, the North Korean government, after a few days, might have proudly announced that it had sunk both ROK and US boats. If US and ROK governments announced before then that the sinking was probably not the result of a North Korean attack, both governments would risk being criticized by citizens, and high officials would have had to assume responsibility and resign. If it was truly not an attack from the North, the US and ROK governments would be expected to quickly announce that it was not from the North. Jaju Minbo, a leftwing newspaper close to North Korea, perhaps simply wanted to show the power of North Korean military. As noted, a US-ROK joint military exercise was in progress that day near Byaengnyeong Island and it is highly probable that the Cheonan was at the site as part of the exercise. If a military exercise was going on, then other US and ROK ships were present. So if a North Korean submarine did attack, the US and ROK would have fiercely counterattacked and sunk it. Even if they failed to sink it and it escaped, if there had been an attack from the North, then the US and ROK could stand in the position of justice for simply having defended themselves, so they would immediately have announced that such a battle had occurred. The North feared that the US and ROK would use the joint military exercise as a pretext to move north and attack its nuclear facilities. Pretending to conduct a military exercise as a cover for a real attack is a plausible US military strategy. For the North to attack in such a situation would be suicidal as it would give the US and ROK a pretext for war. If the boat was not sunk by an attack from the North, the remaining possibility is that an error occurred. I suspect that the US military had not informed the ROK that an American submarine was stationed underwater near Byaengnyeong Island. If the American submarine that sank at the third buoy was underwater for a long time, it follows that it did not participate in the joint exercise that day (it had other duties). I think it likely that the US submarine, which was off the coast to the south of Byaengnyeong, happened to approach closer to the shore than expected and ROK forces, mistaking it for a North Korean submarine, fired. When the US submarine returned fire, both boats sank as a result of a friendly attack due to a misconception. The US submarine must have known of the approach of the Cheonan with the use of a passive sonar used for receiving communication. But if the American military was keeping the presence of the submarine secret from the ROK, then the US submarine could not communicate by radio with the Cheonan. Following the sinking of the Cheonan, media and political circles in South Korea uniformly expressed condolences. Concerts and entertainment events were canceled one after another. The rightwing suddenly became active, demanding that the government “counterattack North Korea.” ROK local elections will take place in June. The Cheonan political situation will greatly influence the campaign. Donald Kirk, an American reporter in South Korea, who is familiar with the American military situation, compares the Cheonan incident to 9/11. Some people say that this is going too far. But the possibility that they wish to conceal, that the Cheonan was sunk by friendly fire from the American submarine, is achieved by casting suspicion that it was sunk by North Korea. The result is that political circles and society are aroused, naturally making Americans want to liken the incident to 9/11. An opposition member of the ROK National Assembly challenged the Minister of National Defense, demanding that the truth be revealed and noting that the sinking of the Cheonan may have been a mistake made by the US military. He was criticized by rightwing media as “a foolish congressman trusting conspiracy theorists.” The same label was applied by the mass media to US and Japanese representatives who sought to inquire into the truth of 9/11. Following the sinking of the Cheonan, if the US and ROK had announced that the Cheonan was attacked by the North and they would counterattack, the result would have been full-scale war. However, the US military in South Korea is moving toward withdrawal. The command in case of emergencies is scheduled to be transferred from the US to the ROK military in 2012. Moreover, leadership of international politics in the Korean peninsula is in process of transfer from the US to China with the approval of US administrations from Bush to Obama. Within the military-industrial complex centered in the Pentagon, there must be opponents of multipolarization who wish to reverse this. They do not wish to sit back and watch East Asia fall under Chinese hegemony in this manner, with US military withdrawal. They naturally seek to take advantage of the Cheonan incident to induce war between South Korea and North Korea, and, as at the time of the Korean war, develop it into war between the US and China so as to reverse multipolarization in East Asia. Although I may be projecting too far, one may even suspect that they provoked the friendly attack by concealing from the ROK military the underwater navigation of the US submarine around Byaengnyeong Island. If a great war again erupts on the Korean peninsula triggered by the Cheonan Incident, even if Japan does not bribe the US with the “sympathy budget”, the stationing of US forces in Japan would continue, and the US would again view Japan as an unsinkable aircraft carrier. The Japanese economy would thus again benefit from Korean special procurements after sixty years. This would be a desirable outcome for Japanese who favor dependency on the US. However, amidst the strife centered, US multipolarists appear to be stronger than the military-industrial complex (and US-Britain centrists). The result is that the Cheonan Incident has not led to a second US- Korean War. Further, what is regrettable for those in Japan and the ROK who wish to continue dependence on the US, the US has transferred to China the role of mitigating the aggravated North-South relationship. Chairman Hu Jintao of China, on 30 April, talked with President Lee Myung-bak who attended the opening ceremony of the World Expo in Shanghai. Three days later he hosted a visit from North Korean President Kim Jong-il, making possible a China-North Korea summit. It is unclear whether Six-Party talks will be held subsequently, but China has certainly strengthened its role as mediator between North and South Korea. Many South Korean citizens have come to distrust government pronouncements on the Cheonan Incident. In the ROK, the fact that the American submarine sank near the third buoy may change at some future time from “conspiracy theory” to fact. As long as ROK national policy remains one of dependence on the US, the matter of the third buoy will have to be suppressed. But to the extent that the ROK moves toward multipolarization (emphasizing China and coexistence between North and South), the lid will be taken off.